Breaking news: Impact Theatre, who recently had a successful fundraising concert, have held over their production of Fahrenheit 451. Their first week, from last Tuesday to next Saturday, has sold out completely, perhaps not surprising given their intimate space and increasing local profile. Three new dates have been added: next Thursday 18 May through Saturday 20 May. 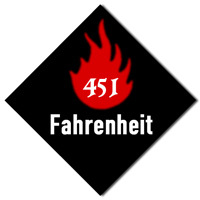 Fahrenheit 451 is based on Ray Bradbury's own script of his novel. It concerns a society in which books are banned and fireman are tasked with burning them on sight. I saw this production on opening night and was impressed, as usual, with how the play has been staged. The use of sound and lighting convincingly created a futuristic world without recourse to cliched devices. Like most SF writers, Bradbury was more concerned with the world of his present (the nineteen-fifties) than any future. Nonetheless, the ideas are timeless and some seem to ring true more today than when the book was published in 1953. For example, the idea of playing out daily psychodramas for a television audience has been instantiated in the world of reality TV almost exactly. Strangely, Waterside Theatre in Derry is also mounting a production of this play, this time in early June. And there's a new movie in the offing. Produced by Mel Gibson's company, and with The Green Mile's Frank Darabont directing, it is sure to be another piece of Hollywood pap. Well worth your time, however, is the unusual 1966 version by Truffaut. This film stars adopted Irish actor Cyril Cusack as the fire captain and Julie Christie in two roles. It offers a peculiar view of the book, with certain elements cut out (eg: The Hound) that are very effective in Impact's version. I love the wordless title sequence, perhaps my favourite ever, and some of the strange dialogue, rendered more peculiar since Truffaut barely knew English (this is his only film in the language). You can buy the DVD through these links and support this site at the same time. "Now, what do you think... Linda?" Note: The three additional shows are starting at 9pm, not the usual 8pm. The three extra nights went well, with audience and cast alike thinking these were the best of the run. The last evening corresponded with the huge Munster match, so I think it did not sell out, for a change. I hope you got in to see the show while you could.